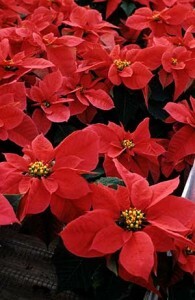 No, poinsettias are not poisonous! Certainly, the leaves and bract don’t taste good and eating them might cause a stomachache and in rare cases, vomiting. However, a review of established poison control centers information and published sources will document that poinsettias are not poisonous. And now that you have read this, it is up to you to correct the misconception if brought up by others. There is one potential issue with poinsettias and that is the latex. Besides being messy, some people might be sensitive to the latex, especially those with a latex allergy. The majority of people will have no reaction to poinsettia latex. If you get latex on your skin, wash it off. You will want to do so anyway, as it will get messy and sticky otherwise.